Conservative leader David Cameron is urging other party leaders to back a plan to allow voters to sack their MPs. "If we cannot have an election now we should start looking at recall powers," he told BBC One's Politics Show. He also defended his own expenses claims after stories suggested he could have saved taxpayers money by paying £75,000 off his second home mortgage. He said he believed his claims had been "reasonable" but would face his party's scrutiny panel like other Tory MPs. 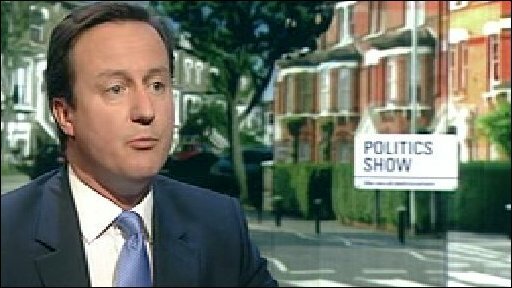 According to the Mail on Sunday, Mr Cameron paid off the remaining £75,000 of a mortgage on his London home using his own money in 2001, shortly after taking out a £350,000 mortgage on his constituency home in Witney, Oxfordshire. He used the second homes allowance to pay the interest on the new mortgage. Mr Cameron did not break any rules and he told the BBC taxpayers had not lost any money as a result of his actions. "I think what I did was very reasonable, which is that I bought a house in my constituency in 2001 at the time of the election. "I claimed the mortgage interest on that house. I was actually paying out more in mortgage interest than I was claiming. But, yes, I was claiming a large amount. "And over a time I managed to pay down some of that mortgage and I'm now claiming, as well as the mortgage interest, for some very basic bills like council tax, electricity and heating and the rest of it. "So I don't think what is being said that somehow I could have reduced the claim on the taxpayer. I don't think that's right." He said the public wanted a chance to "sit in judgement on MPs" and called on Gordon Brown to hold a general election in late July or early September rather than next year. This would be "better for the country" than a "rash of by-elections which I think would actually kind of deflect from the need that everyone feels for a general election," he added. But, in the absence of an elections, voters should be allowed to "recall" MPs who have behaved badly. Liberal Democrat leader Nick Clegg has led moves for a "recall" mechanism that would be triggered if 5% of constituents signed a petition demanding a by-election. Prime Minister Gordon Brown has said the idea will be considered as part of wider reforms aimed at cleaning up Parliament but cautioned against acting without the "full facts". He told BBC News every MP will have to go "through a process where their receipts and expenses will be examined in detail for the last four years". He denied dithering but said all MPs had to be afforded "due process". But David Cameron said it was "not good enough" to "ask whether it was within the rules at the time. We all know the rules at the time were not any good". He said he backed Mr Brown's plan for a committee to look at past expenses claims but did "not have much faith in it". And he called on other party leaders to sit down together and agree immediate plans to allow constituents to get rid of MPs between elections.